At the same time we bought a reverse osmosis drinking water filter (the kind that doesn't waste a bunch of water as it filters), having read that this was the purest drinking water you could get. This sounds like a good thing when you consider that our water supply is full of scary stuff these days like pharmaceuticals, lawn fertilizer and crop pesticides, not to mention fluoride, chlorine and a whole bunch of other junk I don't want going into our bodies. It's not that far-fetched at ALL to think that a little bit of each of these toxins, building up over time, could definitely have detrimental effects on our health. 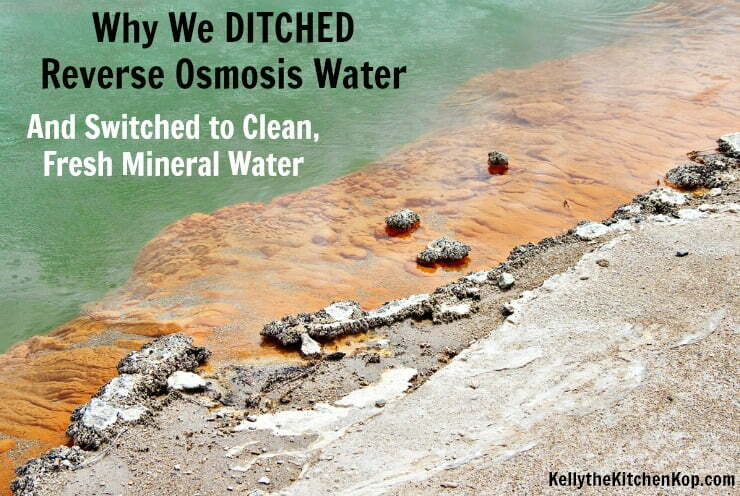 However, it wasn't long after we got that system that I realized the big downside: reverse osmosis strips out almost everything from your water, it even takes out most of the minerals! I've heard it said that reverse osmosis drinking water and distilled water are like the “white flour” of water. By adding plenty of sea salt to our food, drinking raw milk, and getting in lots of bone broth. Since pretty much everyone is deficient in Magnesium, I take these Magnesium tabs and also supplement with every-other-day Iodine — I tried remembering to use this Magnesium 20 minutes before showering, but rarely did. Getting the kids to take any supplements is like pulling teeth these days. We also tried to get the kids, and us, to remember to add mineral drops to our water, but none of us actually did it very often, and they made the water taste weird. At night when brushing my teeth sometimes I'd have a taste of our water in the bathroom that didn't go through the RO system, and it just seemed more fresh or “alive” to me. Sounds odd, but that's the only way I can describe it. I just wanted the taste of real, fresh water from our faucet again, but without all the scary toxins that are in regular tap water! Read more here about How I Stopped Painful Leg Cramps at Night (They came with menopause, yippee) & Why I Love Our New Water Filter! There are higher-end RO systems that are set up to add the minerals back in without you having to remember the drops, but it still just doesn't seem natural to have to add anything back in. And really, how can adding in specific minerals ever really make up for the many trace minerals and naturally occurring minerals in fresh water anyway?! 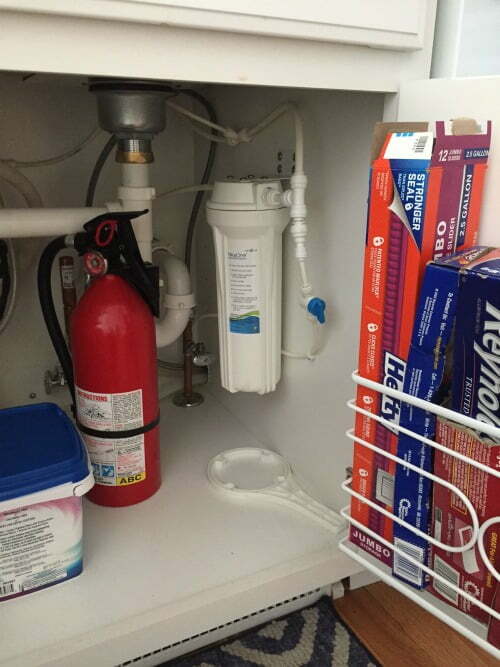 My friend, Jill and her husband were moving and needed to find an affordable countertop filter option (reverse osmosis systems are expensive and there's no countertop option; the Berkey is expensive plus a pain to always refill, plus it's lunky and takes up SO much room), so she found this countertop system that they love, which she wrote more about here: The best water filter on a budget. That got me looking into similar alternatives to reverse osmosis with under-sink options. Here's the water filter we purchased. We also got the refrigerator kit you'll see at that link (to hook the filter up to our fridge water), some extra tubing, and an extra CeraMetix replacement filter to have on-hand — then when the time comes and we need to put in a new one, we'll buy another right then, so we always have one when we need it. ***Update: See our kitchen remodel video here, and yes, the water filter is installed and it tastes great, plus I love knowing all the minerals are still in there! 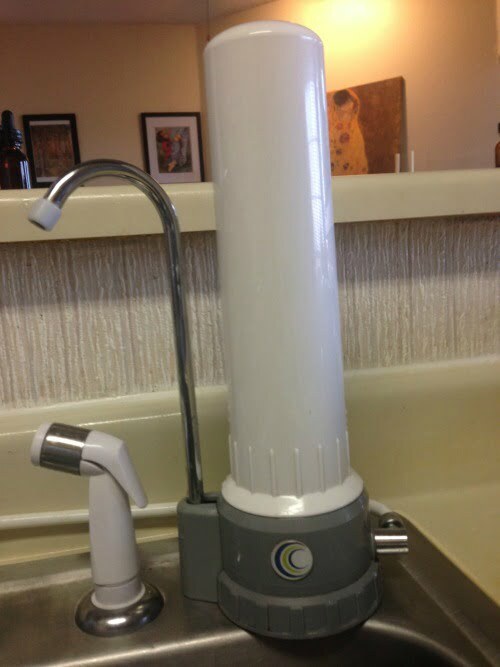 Just as the company says, the filter does a GREAT job of removing the fluoride and chlorine from our water! Here's an interesting note that this guy shared with me… Apparently normal fluoride levels in municipal water are “supposed to be” 0.7 (that's for the state of Michigan or maybe he said in our area, I can't remember), but where we live in Rockford they're naturally occurring at 0.6, so they were able to get by with not adding it to our city water since it was so close. We haven't had fluoridated drinking water in our home in at least 14 or more years and have still had ZERO cavities. Read more about the dangers of fluoride in your water here. Yes, you don't have to worry about the stuff municipalities add to the water like fluoride or chloramines, but you have other ground water issues to be aware of like pharmaceutical toxins and things like herbicides/pesticides and/or glyphosate from local farms. Sadly, no one can assume their water is pure these days. I'm so thankful we found affordable and trustworthy alternatives to reverse osmosis and I can feel great again about the water my family is drinking! See all my posts about safe and healthy water in one spot. I also have a CeraMetix filter, although it’s a gravity system made by AquaCera itself. But how do you know that the filter does not remove healthy minerals–since it removes almost everything else? Why wouldn’t it remove those too? Hi Kelly, thanks for this review! It helped my search to switch from RO myself. We ended up going with the the Nokia Two from Aquacera. Have you found that the filtration system raises your water’s pH? Our tap is 7.5, but through the filtration system it’s 9.5. Can you provide a link to the system you bought? I was unable to find that model with a google search. Thank you!! Quincy, no, I haven’t checked ours, but you went with a different one than we did so it probably wouldn’t be the same anyway. Also, here’s an interesting related post you may want to read: https://kellythekitchenkop.com/who-should-eat-an-alkaline-diet/. So it’s ok to bathe in the fluoridated water? I’ve been searching for a whole house system…. We have a whole-house system too: https://kellythekitchenkop.com/whole-house-filter. I originally WANTED a reverse osmosis filter, but am glad we finally wound up with this kind of setup, instead. We add the minerals back in to our RO water. Kerry Lake — we did that too for a while, I talk about that in this post. Any opinions on alkaline water? Since Berkey does not offer a full spectrum filtration for shower head (we r in apartment & can not use a whole house water filter & wish not 2 bathe in & absorb toxins ie: chlorine, herbicides, pesticides etc.) Can anyone throw me a bone on what filter maybe out there that would fit the bill? Im at a loss at this point. We switched from the 14-stage to the NilusOne per your recommendation and have been very happy. Thanks so much for sharing Joan Hawley — we love ours too! I have done a bit of research and thinking since I posted the questions to you. The filter only filters to a specific micron, which in this case does not filter the small particles of minerals and just enough to filter the smaller amount of Fluoride. The matter of finding an additional cartridge for Fluoride removal is still looming though. I would love it if there is a choice of this? Are you having any luck finding one? Hi Andrea, I contacted the company for more info, but hadn’t heard back then forgot. Thanks for the nudge, I’ll try again! Forgive me if this has already been answered, I need to find a whole house system to mainly filter uranium and pesticides from local agriculture that is in my well water. Any recommendations? We just had our whole house filtration a system serviced. The technician said that the reverse osmosis portion now has a new component that adds back in the trace minerals since people were complaining that their water was stripped of everything both good and bad. He said it’s a newer feature. I’m excited to now have this as part of our system. Hi Natalie, yes I mentioned that option in the post, & it’s good for those with RO already, but I still wanted the all natural minerals instead of adding any back in. Sorry but Berkey fails most of the time. The filters are a pain to prime and to clean and ours failed the red coloring test. I also read from trusted sources that they sent the water filtered thru Berkey for a lab test and the results were not what was expected. We returned ours and for now are using an RO and I add mineral drops to the water. Berkey is good in an emergency but not for everyday use. 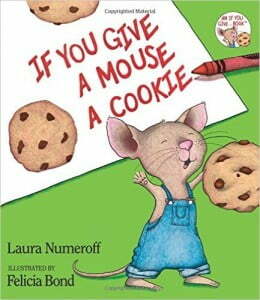 Just read the negative reviews on Amazon. Hi Kelly, it’s Didi from The Olive Bar in CA! We met at the WAPF/Wise Traditions Conference in November. Do you know anything about the Clearly Filtered company? I found them as an advertisement on your blog. Anything you’ve heard would be appreciated. Nope, sorry, no idea about that company. That was just a random Google ad on my site. Ok, true, but if you take just 1 or 2 Klamath or any super-food that has minerals, problem solved! Also i would never accept a filter that remineralizes water, because the minerals they use are inorganic and hence non-absorbable by our bodies, plus, they clog-up our arteries…, whereas superfood minerals are organic and absorbable by our bodies and do not clog up our arteries…, love you all! This all makes my head hurt. How has something as basic as drinking water become so expensive and complicated?! 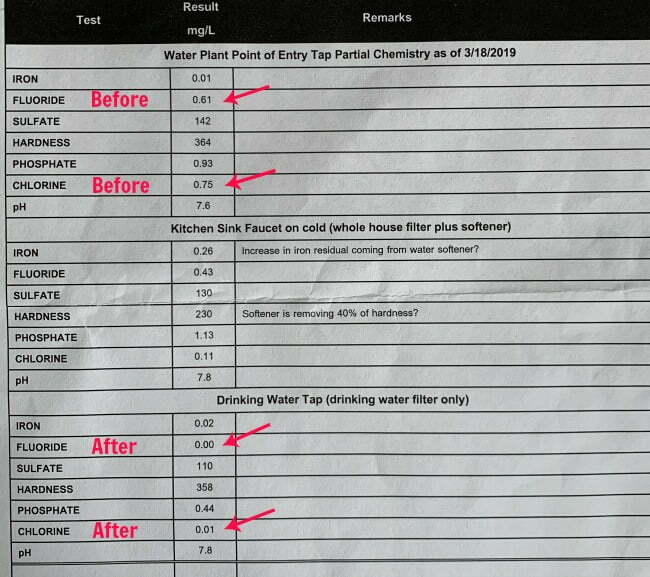 For independent testing to see if their Berkey was removing the flouride as it stated and I believe all 3 friends came back with way less flouride removed than Berkey claims. They contacted Berkey who gave them the run around and claimed the water needed to be a certain Ph level in order for it to remove all the flouride. They contacted Berkeys “independent tester” whom Berkey referred them to only to never hear from them after multiple phone calls and emails. I am throughly disappointed in Berkey as a company and how they handled this situation. I was planning on purchasing one as we have flouride in our water but now I will not due to their shady customer service practices and misleading information. Still researching better options. To all that add minerals back to their RO, what minerals do you use? I was about to buy Trace Minerals but noticed it had lead, cadmium and other concerning ingredients listed. You can also buy mineral filters to add to your existing RO system that add all the minerals and good stuff back in. We have been very happy with ours. We recently stopped using our RO system and got CeraMetix filters and the difference I notice with thirst is noticeable: I could drink an 18oz RO glass and still feel “thirsty” whereas an 8oz glass of CeraMetix is satisfying to my thirst. I still drink lots, but my thirst is quenched properly it feels. Kelly the Kitchen Kop I want to install a WHF when we redo our kitchen. What do you recommend? Is there no option to whole house filter out everything? You need the WHF plus a separate drinking water filter!? Theresa Marie Cushing I recommend this one: https://kellythekitchenkop.com/whole-house-filter. And no, you also need a drinking water filter to get the Fluoride out and other contaminants. Cerametix is good.. much better than Berkey for fluoride removal, but still only about 80%. You can get a mineral cartridge for a RO system. You can also fill a gallon at a time and premix the mineral drops so you’re not doing it for each glass. I don’t remember to be honest. I know I was specifically concerned with chlorine & fluoride. I mention that in the post, why I still don’t care for that option. Interesting point! We have been wanting to put in a filter, especially since I’ve woken up about fluoride. Hubby has talked about RO for years as if it’s the best so I know that is what he planned to get us. Looks like we need to do more research! Where is the science to back up the claims of what the filter removes? It would be more helpful to direct the audience to an independent certification body, like the Water Quality Association, who independently tests and certifies drinking water treatment products. They not only test to make sure the product removes what it claims, also that it does not contribute any harmful chemicals from the materials it is made of. The company has all this info. 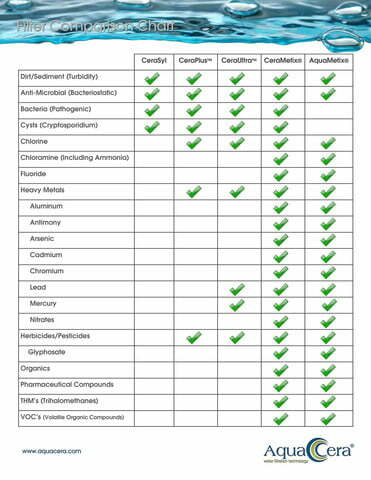 The CeraMetix® elements have been tested in accordance with NSF protocols for cyst, turbidity, particulates, lead, chloramines and chlorine reduction (Class 1). Is that not what you’re looking for? Hi Kelly. Just wondering how happy you were with the under the counter system you bought. In the post you hadn’t installed it yet. We are looking for something to replace our RO system. Thanks for all the info! Kelly, which lab tested all of these things for this company. I am curious. We have a Pusanova system. Love it, too. But it is on the higher end of pricing. Could you please let me know about the lab who did the testing? Is there one particular indpenendent lab that everyone trusts? How often do find yourself changing the filter, Kelly? We just got it, so I’ll let you know. Update, yep, our first filter lasted for one year! Kelly the Kitchen Kop when the sales guy sold it to me, that was his pitch. It remove the bad stuff and added the minerals back in. In your conversation with the company, did they say HOW they are able to leave the minerals in? I just find it odd that somehow they are able to do this, but the other RO systems that look just like this one don’t. Were you satisfied with the answer they gave you? Hi Kelly. I hope you will still receive this message, knowing that the last post was March. Looking at these posts I think what’s being overlooked is that although I do agree that the filter in question is a really good filter, it would still however, remove all particulars from the water, then add the minerals back in, given that logically it could not choose what is friend or foe. How does it then return these necessary minerals (which we get enough through our food anyway)? Did you know that not all natural sources of natural water contain the full load of minerals? I’m in the process of head hunting a good system at the moment and this filter sounds great as opposed to an osmosis. I would however, like a bit more fluoride removal. I was therefore wondering if the option for an extra fluoride plus cartridge could be added? Oh the headache! ? Wonderful! Thank you Kelly. ? Andrea, I can’t find where I ever replied to you about this. This filter doesn’t need to “return” any minerals back in, because it still has the natural minerals in there and they aren’t stripped out at all. Regarding your Fluoride question, if you’d like to email me I can put you in touch with the company so you can look into that more with them: [email protected]. No, it wouldn’t remove all the minerals. Berkeys are great. @Emily – I mention in the post, it’s just that they’re so big & a pain to refill. Those of you with the berkeys….we have one too…and love it. But not really good at figuring when the best time to change to filters is? What do you guys do? Kelly, do you still think Berkeys are ok (aside from the bulkiness)? We JUST purchased one but haven’t put it together yet. We’re renting so can’t put in an under sink device right now. If it were me, I’d rather go with the countertop model mentioned in the post. What do you use to filter bath/shower water? We got a whole house filter from a local place many years ago, but it was just like the one linked to above (https://kellythekitchenkop.com/whole-house-filter). Thanks I missed that part. Also thanks for helping me figure out these water filtering issues! We just moved and now have tap water (fluoride added also):-(. We did get water from a wild spring once that was listed under Find-a-Spring and loved that water but it’s not exactly close by. Do you have any experience with wild spring water? Hi again Marilyn, no I don’t, but would love that option! I might pay to have it tested though, since you wouldn’t know for sure what’s in there.